Slideshows are a fun way to show off your photos. You can add nice transitions and animations to spice slideshows up. You can also add music to make them even better. 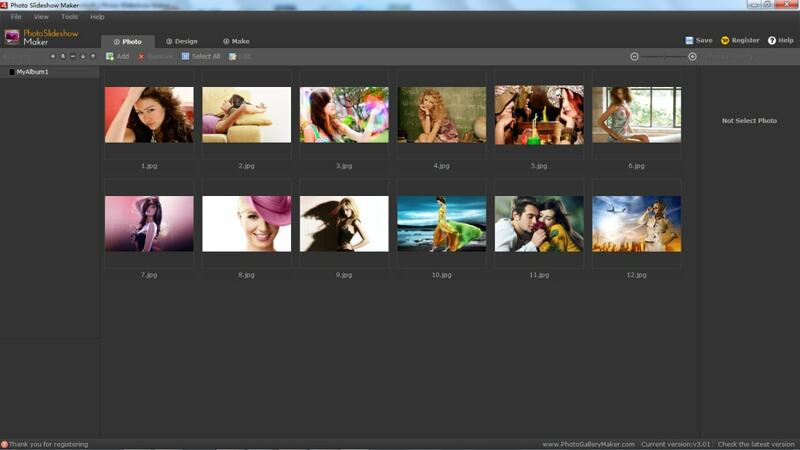 The Photo Slideshow Maker makes creating slideshows into an easy affair. Just choose the photos that you want to include in the slideshow, add various effects and transitions, and click Make. The program can save slideshows into different file formats such as SWF, HTML, and EXE. It’s a shame that you can’t save it in video file formats, but not all programs can save in the file formats that the Photo Slideshow Maker can so it’s not a point against this program. There are undoubtedly better slideshow makers, but this one is pretty good too. Photo Slideshow Maker is the Best Flash Photo Slideshow Software, helps put your photos into very cool Flash Photo Slideshow only simple steps.you can upload for Facebook,MySpace,Blogger and your personal websites easy and fast. The digital images made ? ?into slides for home users. Hope to share the images through the form of a Flash slide to a friend's social network users.